PORTSMOUTH – The Historic District Commission voted 4-3 to grant a certificate of approval for Cathartes Private Investments’ proposal to build a five-story, 143-room hotel next to 3S Artspace in the city’s North End. The project, which includes a nearly one acre community waterfront park along the North Mill Pond that will be deeded to the city, now moves to the Planning Board next week for potential site plan approval. The $15 million to $20 million project will create 50 permanent hotel jobs and 200 construction jobs, Young said Thursday. The project is being proposed to be built at 299 and 225 Vaughan St., in what is now a parking lot and an auto parts business. The plan calls for demolishing the existing structures and building an AC Hotel there, which will have on-site valet parking spots. 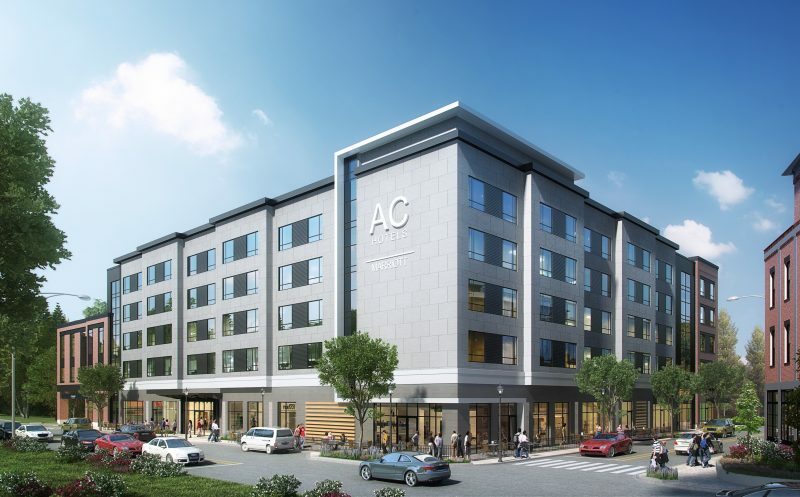 AC Hotels by Marriott are described on the company’s website as a “new way to hotel.” “Each of our spaces is built from the ground up with a visionary’s spirit and a designers’ eye,” the website states. The park, which residents can get to through a pathway between the new hotel and 3S Artspace, is “reconnecting the North Mill Pond to the city’s North End,” Johnston said. The hotel will feature what Johnston described as “a modern contemporary design,” along with large sidewalks from 14 to 18 feet wide. Cathartes is also deeding land back to the city so it can widen the nearby Green Street to 24 feet, he said. The project narrowly received approval Wednesday night, with Vice Chairman Jon Wyckoff voting for it, along with HDC members Reagan Ruedig, John Mayer and Martin Ryan, according to Nick Cracknell, the city’s principal planner. HDC Chairman Vince Lombardi, Dan Rawling and Richard Shea voted against it, Cracknell said. Lombardi said he had concerns about the lack of variation in the roofline and the siding finish of the hotel. “It makes the whole thing rather dull,” Rawling said during Wednesday night’s meeting. “I think it’s appropriate to have cleaner lines and more spare detailing,” she added. If the project is approved by the Planning Board next Thursday, construction could begin sometime this year with a planned opening in the spring of 2018, Young said.